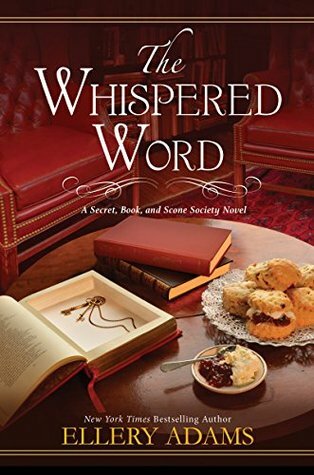 The Whispered Word by Ellery Adams is the second book of the cozy Secret, Book, & Scone Society mystery series. While the characters were introduced in the first book each book does contain it’s own mystery to be solved so it would be possible to understand without having read the first although some character development will be missing by skipping ahead. The Secret, Book, & Scone Society mystery series takes place in Miracle Springs, North Carolina, a small town that is known to be a place of healing. Not only is there a natural hot springs and renowned spa available but many of the shopkeepers in town have their own signature way of healing visitors. 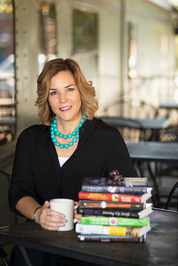 Nora Pennington is one of those shopkeepers being the owner of Miracle Books where she considers herself a bit of a bibliotherapist being able to talk with a customer and since which book would help them with their own problems. Nora and three other shopkeepers, Hester, June and Estella, have teamed up to form the Secret, Book, & Scone Society and when a young girl, Abilene, crosses their paths the ladies know it’s up to them to help her heal. However, shortly after Abilene comes into their lives the body of a local woman is found it comes to question if Abilene had anything to do with the murder so Nora and the rest of the ladies do what they can to find out the truth. The Secret, Book, and Scone Society series is as much of a cozy mystery read as it is an emotional one. The setting of Miracle Springs gives a whole cast of characters with their own emotional story to tell. But along with the healing theme of the books readers will also be pleased with the bookstore setting and mentions of all kinds of book titles and quotes infused in the stories. Tie all of this up around a mystery to be solved and it’s certainly a unique series to follow. Ellery Adams has written over thirty mystery novels and can’t imagine spending a day away from the keyboard. Ms. Adams, a native New Yorker, has had a lifelong love affair with stories, food, rescue animals, and large bodies of water. When not working on her next novel, she bakes, gardens, spoils her three cats, and spends far too much time on Pinterest. She lives with her husband and two children (aka the Trolls) in Chapel Hill, NC. For more information, please visit http://www.elleryadamsmysteries.com. Although I thought the first book in this series was a bit ‘meh’, I could be tempted by this after reading your review. .. I am so glad to see that this series continues to be a good one. I will have to get to this one soon. Nice review Carrie.